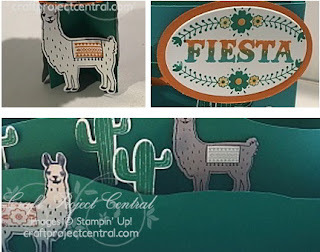 Just Julie B's Stampin' Space: Llama Diorama Fun! It’s fiesta time! Summer is the best time for a party, and who better to help you celebrate than the adorable llama in the Birthday Fiesta Stamp Set? Using the Birthday Fiesta Bundle, you’ll create a diorama that’s perfect for a centerpiece, for holding little treat bags, or just for decoration. You’ll also make a diorama card that can be used as a greeting card or as a party invitation with the party details on the back. And, finally, you’ll make a “Se Llama Cupcake” cupcake holder. With your Big Shot Die-Cutting Machine and a few stamps and dies, your party preparations will be a snap! Best of all, you can get your kids involved. They’ll have a blast helping to create the dioramas. Summer has never been so fun! This cute project was made by Buffy Cooper and you can get her tutorial when you subscribe to the moth of July over at Craft Project Central.